Right now is an excellent time to get into the food and beverage industry. If you want to open a bakery, a delicatessen or even a natural health food market, you are primed to enter the industry at just the right time. However, when you are opening up a retail food business, you want to keep a few things in mind, other than a proper retail industry analysis. 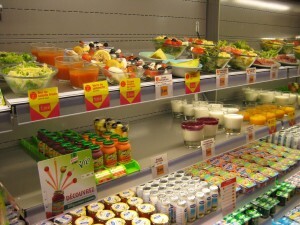 Food – unlike clothing and other things you can buy at retail stores – is purely dictated by individual tastes. Basically, if the food you serve is not good, people won’t like it and they won’t be coming back to your establishment. Other than that, you have a number of other things your want to think about when you open a retail food business. Here are the top six tips for starting a retail food business. 1. Nail down a specialty. These days, the market is run by cupcake shops and coffee houses. If you really want to find success and set yourself apart as a food business, you need to be different, just as outsourcing services are. You need to offer a dish or a delicacy that people haven’t tried before. If you think about it, many people have opened a coffee shop and realized that they are merely a dime a dozen. However, if you want to be that diamond in the rough that everyone clamors for, you need to offer something new and interesting. 2. Perfect your recipe. This is where taste testers come in. In the beginning, your recipe for whatever type of food you are serving may be a little off. If you open your food retail business with a subpar product, you will be immediately doomed to failure. Word spreads fast about the quality of food at a new restaurant. So, you want to have people taste your food, give input and tell you what they do and don’t like. 3. Sign up with the NGA. Signing up with the NGA, or National Grocers Association, is a smart move when you are opening a food retail business, especially a market. In fact, you can sign up for the MY National Grocers plan that offers member benefits and insider knowledge on the food industry. When it comes down to it, having your finger on the pulse is vital when you are opening a food retail business. 4. Have excellent price points. Keeping your prices within a reasonable range is important. In order to do this, you need to evaluate what the average price is for the food you are serving or selling in your area. If your area is a little bit more well off, you may be able to sell items for more, but you want to be very careful. Even the very wealthy don’t want to pay an obscene fortune for food. 5. Find affordable marketing solutions. Once your doors are open, you need to find a way to market your food retail business. Without having a solid marketing plan, you won’t get the kind of foot traffic you need to make sales. At the end of the day, with a little creativity and resourcefulness, you can easily launch a successful and affordable marketing plan. 6. Learn the food laws and regulations you will be required to meet. As a food business, you will need to meet state and federal requirements regarding compliance. Make sure you are familiar with all of these laws. Otherwise, your business will get shut down before you even have a chance to worry about a possible Christmas downturn. It is absolutely crucial that your business meet all food and beverage regulations if you want your restaurant or retail food business to succeed. If you are overwhelmed at the idea of starting your own business from scratch, especially in the current sharing economy, you may want to consider opening a food business franchise. There are plenty of options out there. But what advantages do they offer passionate food industry entrepreneurs like you? Most restaurants fail within the first year not due to the food quality or menu selections, but because of poor business management. A franchise will provide you with a proven business model, so that you can just enjoy owning a business in an industry you are passionate about. In addition to the business information they give you to get started, they also provide support and marketing. If you want to open your own food business, consider a restaurant franchise to exercise your passion without the worry of failing in the first year. Thanks designed for sharing such a good idea, paragraph is good.